to deny the permit or attach strong conditions! on the groundwater discharge permit (DP-1840) for the Copper Flat Mine in Hillsboro. The draft permit authorizes the mine operator to discharge 22.3 million gallons per day of tailings, mining-impacted and domestic wastewater that could contain contaminants and toxic pollutants above state standards. Tell the NM Environment Department (NMED) that the draft discharge permit as a whole is inadequate. It should be denied, but at a minimum, the permit needs to be re-written with conditions for the following reasons. Incomplete Characterization – There is inadequate characterization of the bedrock, leaving the potential for contamination to move through the ground. Pollutants from the mine could leak into groundwater contaminating the area’s water supply, and could reach the Rio Grande. The permit must require that the bedrock be fully characterized to determine the possibility of contaminants leaching into groundwater. State Water Quality Standards Must Apply – New Mexico Copper Corporation claims that the pit lake is not part of the Waters of the State of New Mexico and therefore not subject to surface water quality standards. However, the pit lake will combine with clean groundwater – there will be flow-through during at least part of its operation – and the lake is likely to extend onto public land. The permit must acknowledge that these are Waters of the State and that all relevant water quality standards must apply. Groundwater Monitoring Is Inadequate – Even though NMED has added two additional groundwater monitoring wells, the total number of wells and their locations are still inadequate. The permit must require sufficient monitoring wells to reliably detect contamination leaking from the mine’s waste rock piles and/or the tailings storage facility. – The discharge permit authorizes the discharge of up to 25.3 million gallons per day of tailings, mining-impacted wastewater, and domestic wastewater. 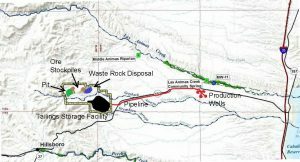 – The mine will dump upwards of 100 billion gallons of polluted liquid waste during its planned operation into a 560-acre pond just 11 miles west of Caballo Reservoir. A collapse or breach at the tailings pond could devastate landowners to the east, Caballo Reservoir, and the Rio Grande. Streams Important for Wildlife, Including Endangered Species– Two arroyos run through the mine site and others in the area could also be impacted by surface and groundwater contamination. The permit must ensure that the mine does not damage vital habitat and forage for wildlife, including several threatened and endangered species. Financial Assurance– The proposed financial assurance in the mine permit is insufficient to cover the costs of long-term monitoring and maintenance of post-mining site reclamation should the company default. This would push the costs of cleanup onto the state.